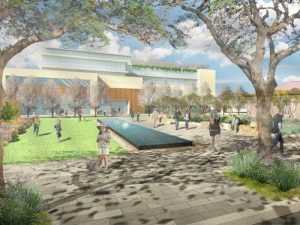 Inspired by what we learnt through the Development Plan Amendment for the Unley Central Precinct, Council has developed a vision for the Civic Centre site. We have determined to lead the way in revitalising the precinct with a potential redevelopment of the Civic Centre. 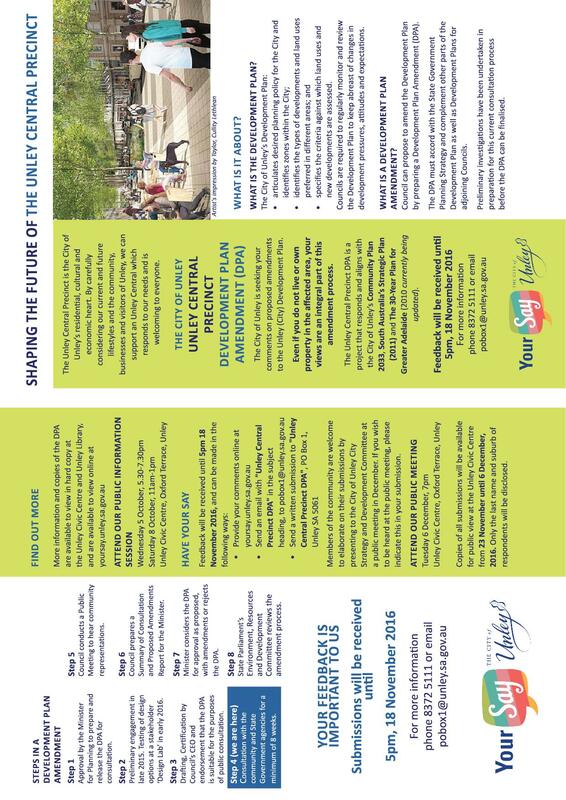 Council’s Vision for the Unley Central Precinct has been for a long time now to revitalise the heart of Unley. We expect this by generating new activity in the precinct and providing more opportunity for residential living. Redevelopment of this site is an ideal catalyst to achieve this. We have taken notice of feedback received during the DPA process. Rather than just facilitate it we realise we can play a crucial and lead role in shaping the Unley Central Precinct and in rejuvenating Unley Road. 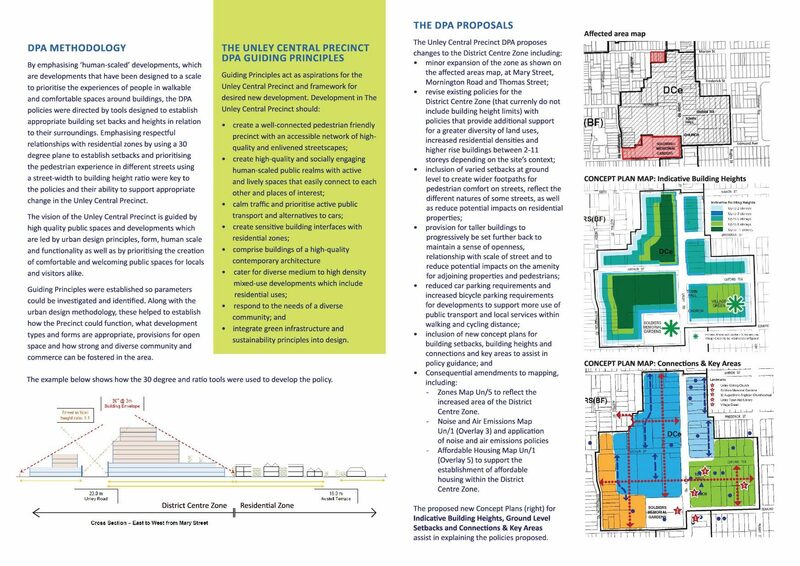 This should spark interest by others in seeing the potential of developing other sites in the Unley Central Precinct. Our Mayor, Lachlan Clyne, has said in his public announcement of the project “I back a redevelopment of this site 100 per cent and I am excited about hearing our community’s ideas as they engage in the process. I fully back our Mayor. 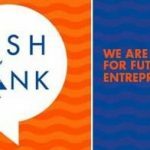 This is an exciting project which has so much potential for our community. the Village Green will also be retained, possibly enhanced. Council will investigate over the next 12 months how the redevelopment of the Civic Complex on Unley Road might look. With the help of our community we also determine what services it might provide the community of Unley. By selling the air rights above the Civic Centre we can fund the project without impacting on rates. This means we can provide improved or enhanced current facilities and/or provide new facilities our community is asking for, whatever they may be at no cost to the community. We would remain as manager of what would be a community title for development. 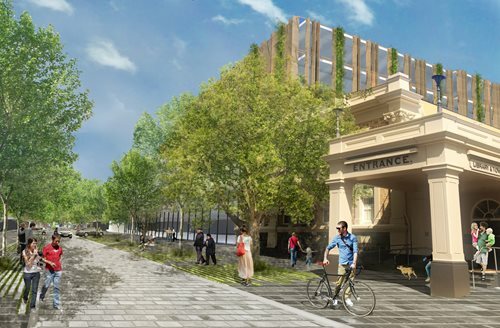 Watch this space as Council’s Vision for the Unley Central Precinct evolve with your help. 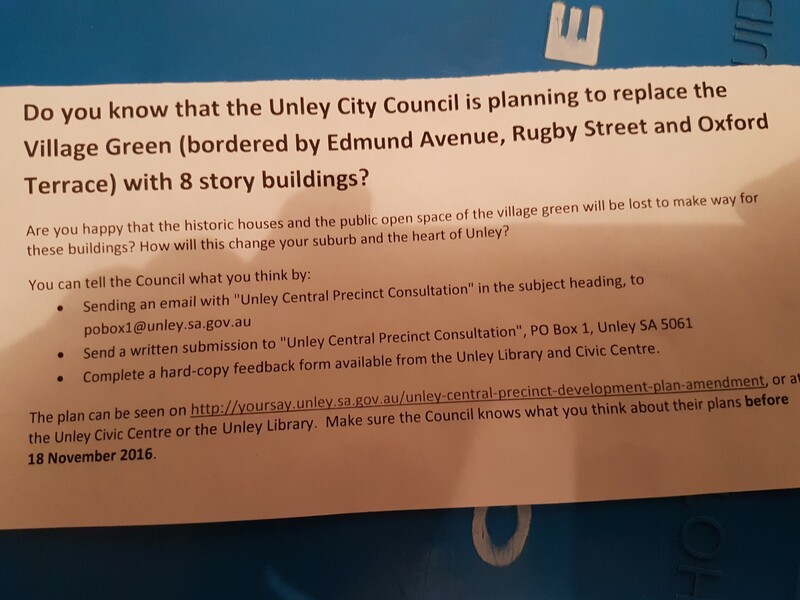 Always conscious of Unley’s limited green open space Council seized on an opportunity that recently presented itself to us. When Council became aware of the pending closure of the wholesale plant nursery located in Katherine Street Fullarton in 2012 we swooped in and negotiated the purchase of the land. This area of Fullarton was seen as in need of extra open space. Council purchased the property for in excess of $2.0m. Courtesy of the Minister for Planning we received grant funding towards the redevelopment of the property. This was under the Government’s commitment to provide money for councils to invest in local reserves and playgrounds. The playground has been constructed in accordance with designs the you participated in. Features include a junior playground with a theme of integrating play with nature. Other facilities provide accessible pathways with seating and shelter for all users. We have in, in accordance with your wishes, provided spaces for contemplation and communal gathering. Your input was important and we thank you for your contribution. 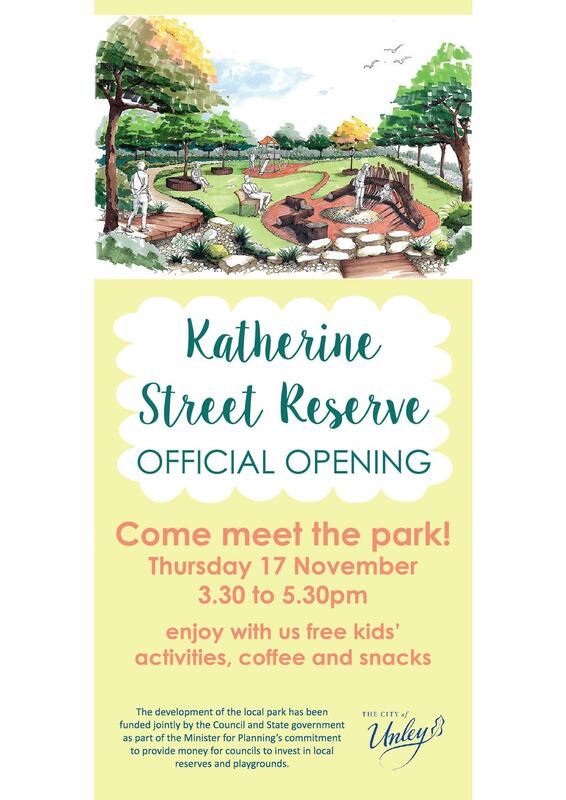 It was important to ensure the design reflected the aims of the community in order to deliver an ‘attractive and inviting’ identity for the new Katherine Street Park and for Fullarton. A true community collaboration. Works on site commenced in April and the program was expected to be complete by the end of August. With the heaviest rains in many a year this has slid back to 17 November. For a long time the site has been a mud bowl. Hopefully the result was worth the wait. We think we have done this. Come along to the opening and see for yourself if we have. 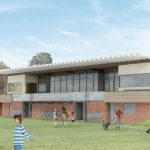 Council is requesting input from ratepayers and users of Unley Oval for the next stage in the Unley Oval Improvement Plan. A forgotten component to the plan is reconfiguring the hill in the north west corner. This is where the oft visited pirate ship is located. The equipment is quite old. 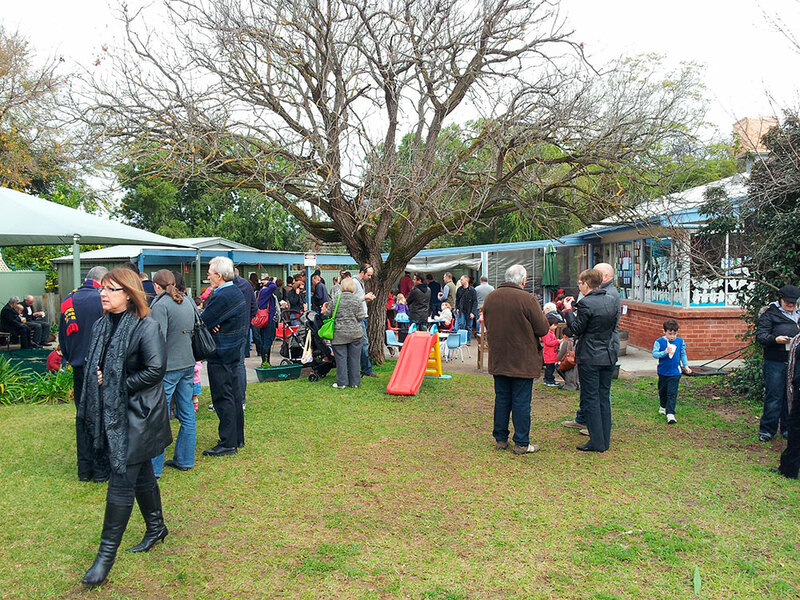 We have allocated funds in the current budget to upgrade the playground. Since the commencement of the improvement plan the focus has been on how improvements to the ground will favour the Sturt FC. It is time now to bring the focus back to our kids. Council does not have any firm ideas on what the playground might look like. We are seeking community feedback to help us develop a great new space. 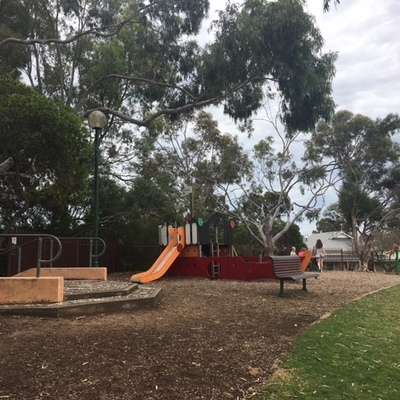 Whilst the ‘hilltop’ playground is not aimed at any particular age group at present, the upgrades will consider play opportunities for age 5-12 years. The playground on the other side of the Oval caters for children younger than this. Replacement of the existing pirate ship and woodchip softfall with new play equipment and softfall, aimed at age 5-12 years. The existing seat/table be retained or maybe relocated. The existing ‘daisy swing’ may or may not be retained. New play equipment (specify type) be installed in (generally) the same location as the existing playground (top of the hill). The view of the oval and Adelaide hills will be maintained. We have determined that a shade structure will not be installed as part of this project and the existing natural shade will continue to be used. visiting the your say webpage here. Unley Central DPA public consultation running out. 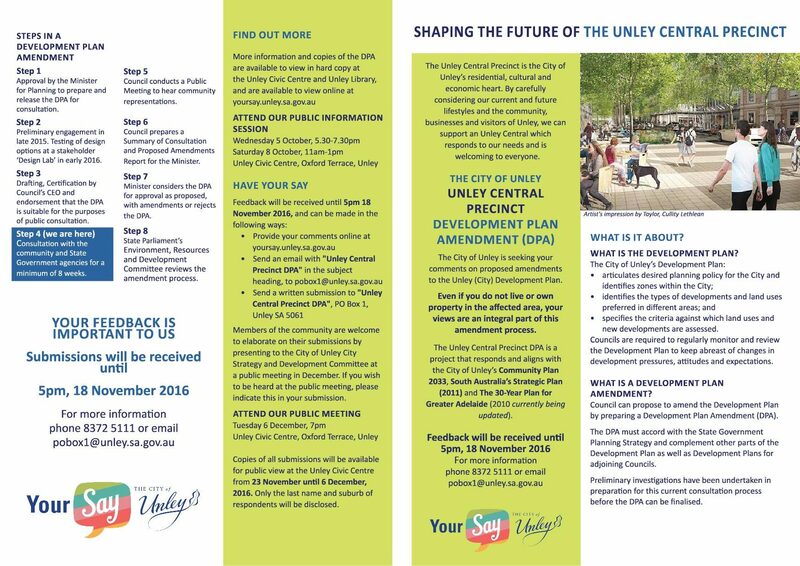 You have just over one month to go to contribute to the final Unley Central DPA submission to the Minister. If you have a say in writing you can attend a public meeting to enhance your observations before council. 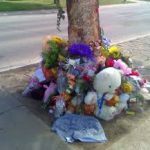 This blog post is an update on my post of 24 September which can be read here. Two information sessions have been held. I attended both to gauge public reaction to the final draft. As the deadline for submissions gets closer I encourage you all to have a say. Don’t wait for a development near you to be proposed to express your concerns. It will be too late. I am encouraged by the mature approach that those who attended the information sessions showed. They recognise that Unley’s approach has been to work with the Government rather than fight them. We were congratulated for limiting the impact on our community, even though concern still exists over what is proposed. Some confusion exists still however as to why we are undertaking this process. Examples follow. One attendee at the information sessions was critical of us because we did not get a mandate at the last Council election to carry out this DPA. He mistakenly believes therefore what we are doing is illegal. The Council actually has a legal obligation to pursue this DPA. If we fail to do it the Minister can do it on our behalf under the Local Government Act 1999. Of course the Government did take this to the last state election, and the previous. Someone else is mistakenly letter boxing a claim that council is going to build an 8 storey complex on the village green. 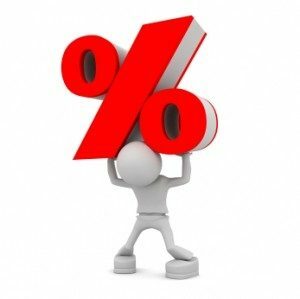 If you are confused a DPA is NOT a proposal to develop property. It merely sets the guidelines with which future proposed developments are assessed. Please be assured also the DPA does not propose 8 storey development on the Village Green. The Village Green is retained under the draft DPA. It could indeed be reconfigured and even increased in size. The Government is asking us (everyone) to contribute to determining what is the future of Local Heritage in SA. The City of Unley Council discussed this at our Council meeting last night. The debate in our chamber coincided with a public forum sponsored by the the City of Adelaide in the Adelaide Town Hall. A pity because I would not have minded being a fly on the wall in that room on the night. We endorsed at our meeting the observations of our Development Strategy & Policy (DSP) Committee (chaired by myself) on what is the future of Local Heritage in SA. 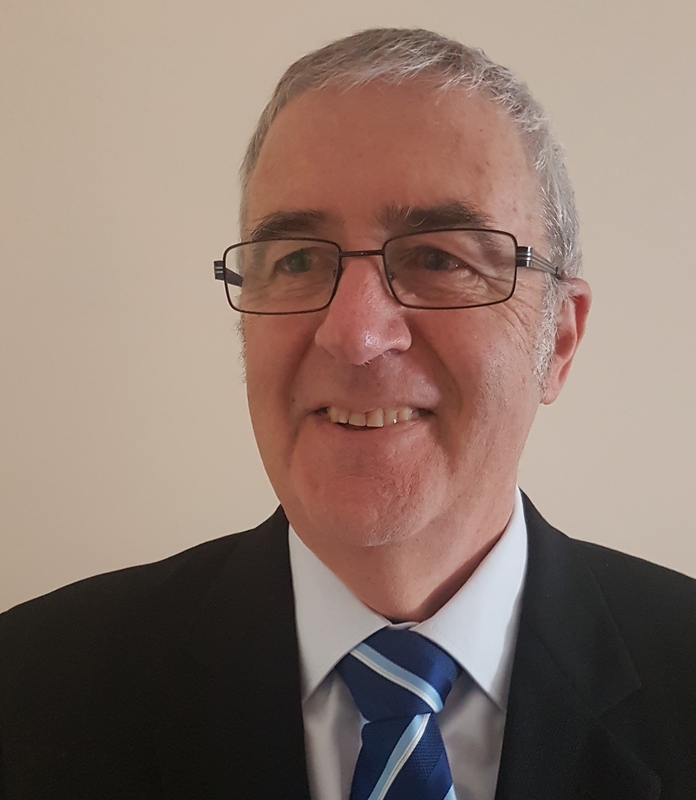 The observations of the Local Government Association and the observations included in Mr Brown’s report to Coucnil can be found on our website page here. Your Council is demonstrating in the most pragmatic way their response to the Minister’s calling. Frustrated as we may be like all others in Local Government we are trying to take a mature approach. Hopefully reasoned debate on our part may influence the Minister to see what he hitherto has not. What is the future of Local Heritage in SA? I attended, along with Deputy Mayor Michael Rabbitt and members of our management, a Seminar last Wednesday hosted by the Lord Mayor and the City of Adelaide. The topic essentially was what is the future of local heritage in SA. 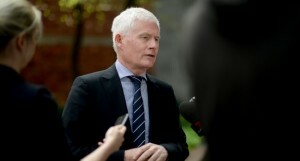 The Planning Minister John Rau spoke at the Seminar. A number of invited guests who each extolled the economic benefit of Local Heritage also spoke. The Minister went to great pains to indicate that he is yet to take a position. He pushed that he was simply starting the conversation. The audience took a different view. They saw the Minister trying to pull on over on them. He did not take kindly as I have seen him do before in public to the assertions that he was hiding the detail from us. I support the audience’s view, and that of the following speakers, that the Minister is struggling with a basic concept of what is the difference between heritage and character. The Minister appears not to recognise the value of “Heritage Character”. He sees heritage as pertaining to a building and character to a collection of buildings. He also, it appears, sees Local Heritage as restricting employment opportunities. Preservation is in the way of development opportunities and the employment that comes with that. This is not how those with whom he found himself in conflict see it. They see areas/precincts/streets, not just buildings, as having historic value. Some areas, in other words, require protection as much as some buildings. Each of the speakers spoke in contrast on his economic argument. They argued that Heritage preservation is a positive when looking at local employment. Their addresses (and the ministers) will be available soon on the City of Adelaide website. I too see the need to protect areas as opposed to simply buildings. The City of Unley does also. 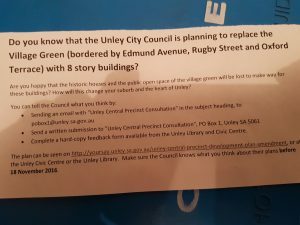 The City of Unley, as much as any other municipality within the greater metropolitan area, is indeed testimony to this. Tonight Council will be considering our response and I will report on this for you. I now ask you. What is the Future of Local Heritage in SA in your opinion? Do you agree with the Minister or do you see his agenda as potentially destroying local heritage for the sake of redevelopment opportunities? After nearly two years of deliberations, the Unley Central Precinct DPA is ready for final consultation. 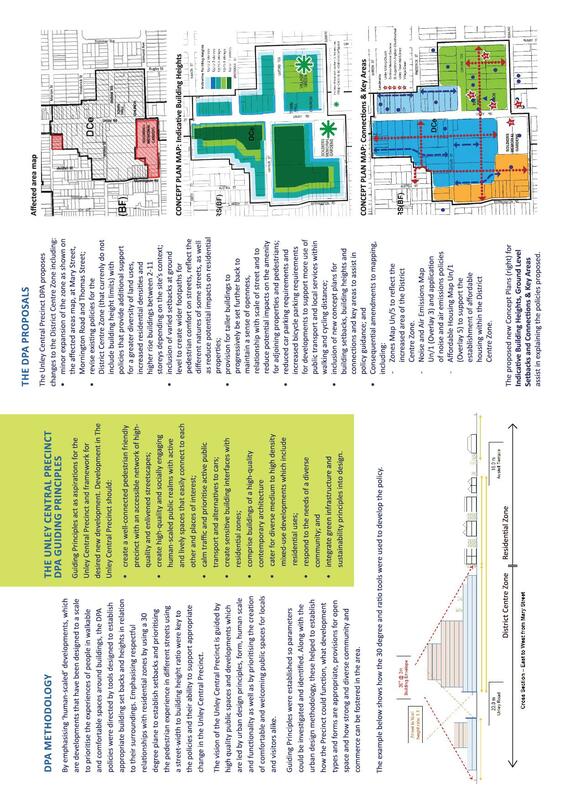 This the final chapter in shaping the future potential of the Unley Central Precinct. The DPA encompasses the recommendations of the Development Strategy & Policy Committee. I am proud to have chaired this committee. 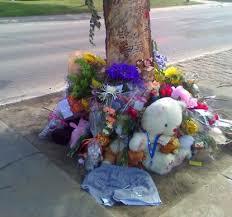 The criteria adopted is the result of all previous consultation with our community. It includes what we learnt earlier this year from the successful Design Lab . We do not need to go to the extent many (including the government ) thought was needed. We believe the DPA will be approved by the Minister. It should achieve his government’s goals. We trust it will be acceptable to our community knowing we have to achieve the governments population forecasts. There is no limit currently to the height of buildings in this precinct. Building heights in the precinct will now be limited. They are to be kept within our previously successful high street 30 degree envelope strategy. Keeping inside this envelope will provide the best interface with surrounding residential areas we could expect to achieve. Significantly the area will now become a mixed use zone. Development will no longer be limited to retail or community opportunities. Opportunity for residential development in the upper floors of the buildings will now be possible. Walking zones through the precinct have been created. This will provide for safer access than exists now, in both the north-south and the east-west directions. Traffic flow management is not included as it is not a planning consideration under the Act. This will be addressed separately by council after the DPA is approved by the Minister. The Unley Central Precinct DPA has commenced. You have until November 18 this year to contribute. Another chance to input into the final draft before it is presented for the last time to DPTI and the Minister. Please take the opportunity. There is still room for fine tuning. Your input may prove pivotal to the best outcome. Councils – the lean machine: that is the catch phrase for a new publicity program being put out by the Local Government Association (LGA). In the early days of this blog site I started a similar series albeit, with apologies, not completed. With the recent threat by the opposition to cap Council rates when in Government. With the State Government imposing extra exorbitant taxes through us. With Marion seeking to withdraw from the Association. Now we see the LGA seeing the need to remind us all what Councils do provide the tax payers of this country. 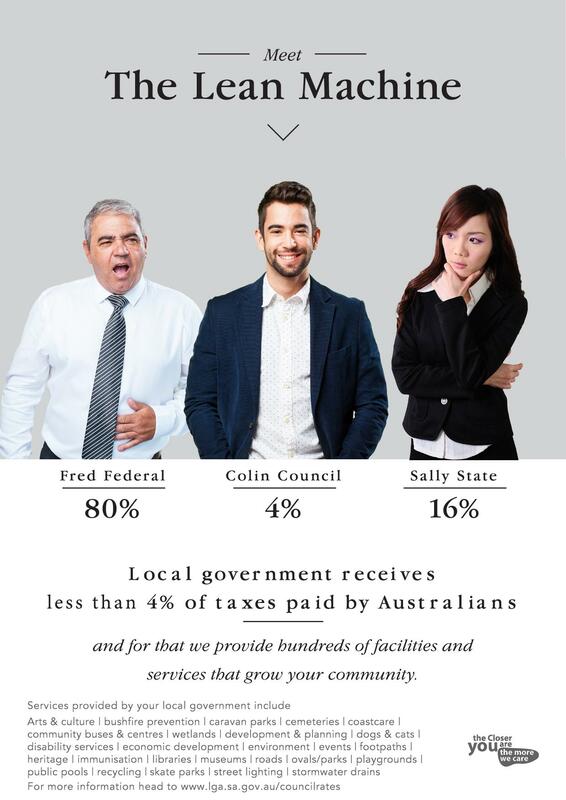 Below is a media release last week by the LGA titled Councils – the lean machine I trust you will find informative. You may have experienced already the start of this campaign. 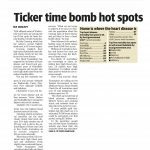 2016/17, it was important for ratepayers to know what they are getting for their money. providing hundreds of services and facilities in their communities,” Mr Pinnegar said. 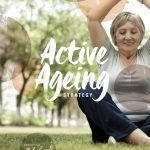 ovals, community events, aged care services, swimming pools and much more. courts, playgrounds, recycling facilities, skate parks, street lighting, and storm water drains. services while taking less than 4% of the nation’s tax. especially with more and more State Government taxes being included in council rates. Housing rebates, which are all paid by councils and ultimately their ratepayers. 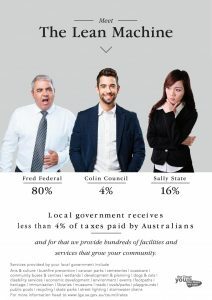 and an unfair share of local road funding from the Federal Government. Hoping this helps all understand the role of Councils – the lean machine.